Round 3 of the annual Pittsburgh Chess Club Championship had me playing another very long game, the last game to finish (which it did after four hours, when nobody else was around any more except the tournament director). For once, I am actually fairly proud of my game, in which I pressed hard with an attack and won. I have submitted the score for consideration in the “Best Attack” special prize category for the tournament. This week’s chess theme is sacrifice in chess. The reason is that in my game, there were many possible points of sacrifice on my end (the attacker), but also, ironically, my opponent was the one who twice sacrificed material for a defensive purpose. Although the sacrifices were not sound, they had some practical merit that I will discuss. I knew ahead of time that my opponent was going to be John Ahlborg, whom I have played once before in a game that I won, also as White. So my “preparation” consisted of nothing other than deciding to play a different opening against him. I should note that I inherently enjoy exploring different ways of playing, so avoidance is not really the purpose, but is actually my excuse to play differently. Black has a passive but actually very solid position. The only way White can possibly make progress is reorganize and find a way to launch a King side attack with f4 and g4 eventually, while Black should obtain counterplay on the Queen side. I correctly punished this error by bringing my Knight to h4 aiming to go to f5. White not only has the two Bishops, but also has the f5 Pawn controlling e5 as well as ready to participate in a Pawn storm involving g4 and then either f6 or g6. Black’s two Knights optically look active but have no real threats at all. At this point, my opponent decided to engage in an unsound sacrifice but one he felt could give him activity and open lines, playing b5. 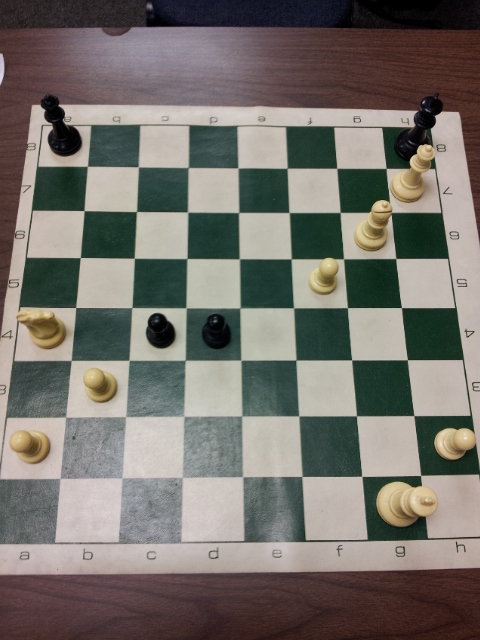 However, after I took the Pawn and returned my Knight to c3, it became clear that the only open lines were for my Bishop pair, and Black is objectively lost. The only question was, how to conduct the winning attack on Black’s King? I got in g4, and then hesitated to play g5 immediately. I decided to “prepare” for the inevitable attack more slowly. Objectively, White has a totally won game. But at this point, time was running low for both sides. Under time pressure, I missed a quick win at one point. I also somehow walked into a less and less winning position, eventually hanging an exchange inadvertently! For round 5, I will be Black against Peter Jansen, who ended up winning his game against Kurt Wallnau on Saturday. I have played a tournament game with him only once before, six years ago, when I was White. I was not at all happy with how I played that game, even though I won (although on time in a drawn position), so I consider our game Tuesday to be my chance to finally actually play well against Peter. I have seen how he plays in the opening, so there’s not going to be an opening surprise coming from him, I think, as White. We will take the battle to the middlegame. Despite some inaccuracies on my part, I played more consistently in this game than I have recently, so I felt fairly happy about this game. Of course, I had cooperation from my opponent.